This is an advertisement for Grove's clothing store. As transport improved and cities developed the price of land and property increased, retailers realised that instead of buying adjacent properties sand expanding into them, the top floors of buildings, previously used for storage and living space, could be useful selling spaces. 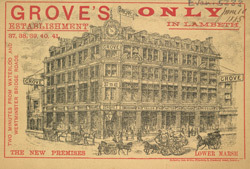 Large department stores like ‘Groves’, featured in this leaflet, opened in cities like London. A large range of goods was sold from mantles and corsets to evening dresses and overcoats. Instead of customers having to visit many different shops they now only needed to visit one.